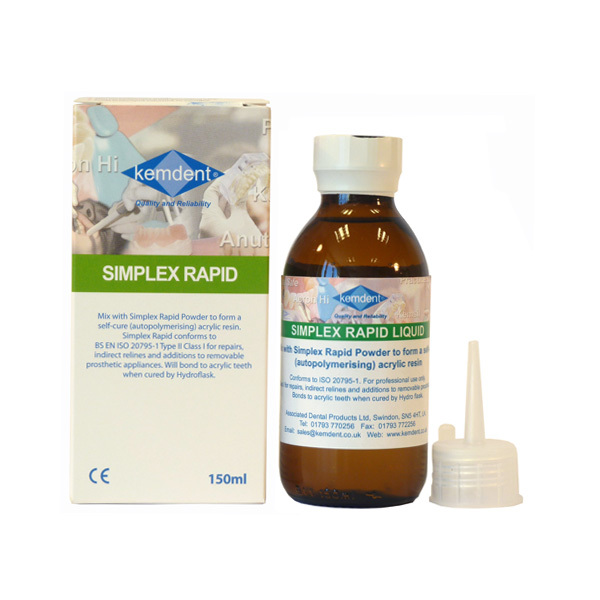 Kemdent’s Simplex Rapid Powder and Liquid is a self-curing and cold cured acrylic material with multiple applications. It mixes easily with Simplex Rapid Liquid, cures quickly using hydroflask or bench cure techniques and is very easy to trim and polish, maintaining dentures that are resistant to breakage and fracture. Once cured it is easy to finish. It is well tolerated by the patient’s tongue and soft tissues. Curing: For best results cure in hydroflask at 40°C fo 10-20 minutes at 30psi. Will also self cure in 20 minutes. "We have been using Simplex Rapid for all of our repairs, indirect relines and additions for many years. We particularly like its porosity-free consistency and good bonding properties, which make it a very reliable product that consistently does the job. We also like the better colour matching we can achieve with Kemdent’s denture base materials, which is extremely important should your dentures come back for additions in the future." Simplex Rapid Repair Acrylic is easy to trim and polish. We suggest using PumiceSafe Universal Cleaner in your Pumice Tray.